Image registration is a well-known problem in the field of medical imaging. 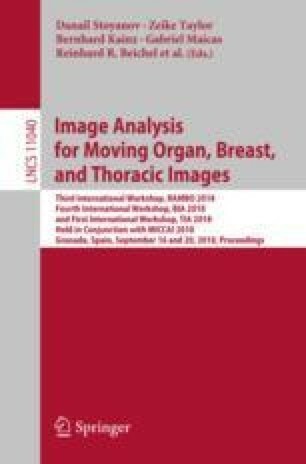 In this paper, we focus on the registration of chest inspiratory and expiratory computed tomography (CT) scans from the same patient. Our method recovers the diffeomorphic elastic displacement vector field (DVF) by jointly regressing the direct and the inverse transformation. Our architecture is based on the RegNet network but we implement a reinforced learning strategy that can accommodate a large training dataset. Our results show that our method performs with a lower estimation error for the same number of epochs than the RegNet approach. This work has been funded by NIH NHLBI grants R01-HL116931 and R21HL140422. The Titan Xp used for this research was donated by the NVIDIA Corporation.